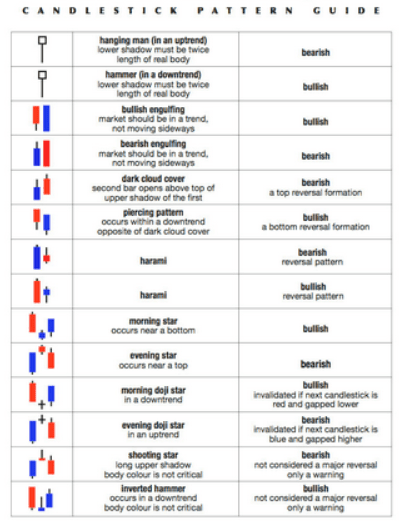 This is a big change from the conventional candlestick patterns so read on. I recently visited one of our Expert4x traders that trades an adapted normal candlestick chart format. He calls it the Resistance candles. 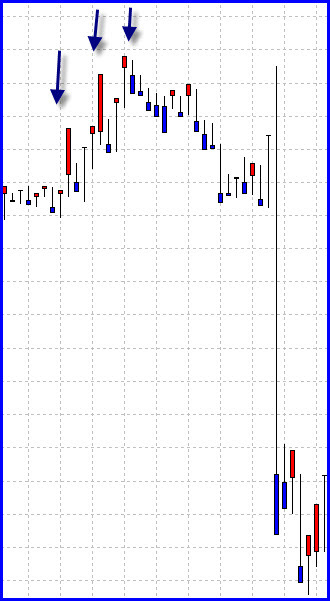 He has created a custom MT4 Chart format for himself. 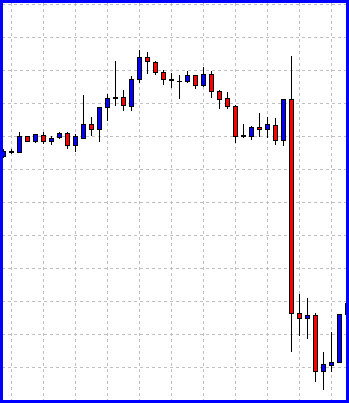 The candles use the same information as normal Forex Candlesticks but the information is displayed slightly differently. The bodies of these candles represent the resistance against a particular move in the market and the candle wick represents the actual gain made by the move or the direction of the trend. This effectively turns every candle into a Hammer or a hanging man formation. A bit different to the normal candle format. He says that it gives him much more information to trade price action. So the bigger the the resistance (represented by the colored part of the candle) becomes the stronger the chances of a reversal. He tells me he prints money with these charts. 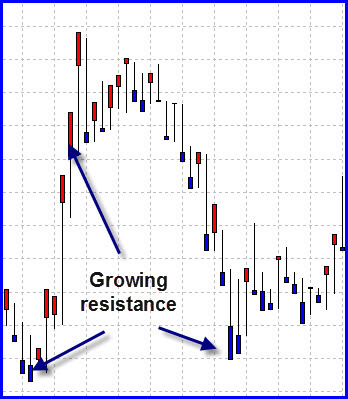 The general rule is that when there you spot 3 strong resistance candles a reversal is almost guaranteed. The other way he uses it is when there is a breakout with little resistance he continues trading with the trend. Anybody else use them? If you have I have opened a discussion in the Forum on this particular chart format. Please note that this chart format is not generally available but if there is enough interest and discussion we will look at making it available for general use by our clients. So please do not ask for it – it is just a tool introduced by Money Making Forex Tools in its continued search for value adding Forex trading concepts and tools. Sounds really interesting! Would love to hear more. Well, adding fibos or some dynamic ma would be interesting. Anyone tested these combinations of tools or indicators? Or would that be a distraction? and in most cases presents as the day’s high and low. And the previous swing high or low makes for small risk to place stop loss!! IT looks impressive. Would love to hear more. Looks like he just swapped the candle body with the candle shadow to help highlight absorption/exhaustion. When I started using mt4 I had thought of using regular bars and adding a candle body to them in proportion to volume delta, and I guess that could also be what he did here. But you can get volumetric candles on NT7 and Sierra charts, so why bother. If you want to see relative volumes/clusters on mt4 you can also use YuClusters (see mt4 marketplace), which gives you a mini-footprint chart on your mt4 screen. Personally I just use the regular candlesticks with free volume indicator. Once you understand the relationship it works fine. It would be great to share some pictures of those charts of the volumetric candles on NT7 and Sierra Charts in the Forum and to show how you would use them to stimulate some debate and discussion. I am not sure if I understand correctly. These candles are actually then candles in reverse? So where the body would normally be he has switched it around to the wick? Sort of. Remember there are normally 2 wicks to a candle. The colored part is the against the candle trend wick of the candle – if that makes sense. Alex, can you show some comparison charts? 1 picture normal candles and the other the modified ones? I do not understand what is modified. Does somebody here use “range bars” ?! – As it is not a standard chart in MT4, I would call that “unconventional” for MT4-Users as well. – Not? – it is not a good format to draw trendlines or channels as far as I can see because there are fewer price spikes at which to connect the TR/channel parallel lines. I just cant see it working for me to be honest…. Thanks for those observations about your trading methods. Yes, you are 100% right. YOU will never make money with this approach. I like that!! 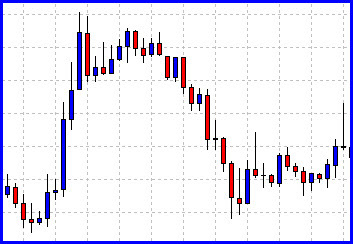 As you know Alex, I have looked at other forms of candlestick, in particular range bars. I have never accepted that we need time to dictate the formation of candles. I would definitely be interested in learning more about this type of candlestick. Hi Mick! – I am happy to read that you have looked at rangebars as well, and I wanted to kindly ask you if you maybe like to share some infos about your experiences – in particular, I am interested if you have done some automated EA’s based on rangebars charts, and if they perform nice? – In manual trading, I know that rangebars DO work – but, so far I have no experience with an ExpertAdvisor that works with rangebars. – I’d really appreciate if you like to share some informatios. – Thanx-a-lot! Alex – I visit your site often as a trusted resource for honest forex information. I do not comment on any site very often, if at all. However, in seeing the brief description, and the charts above, I feel compelled to let you know I am highly interested in exploring more into this chart format. It would be fascinating to see how this could be integrated into various trading methodologies.